We email, chat, Tweet, Facebook , and IM to simply communicate in a digital world with other people. Our communication is speeding up and we use more channels to receive information we are looking for. And there is nothing wrong with it, as the Internet helps us to communicate faster, cheaper and obviously more efficiently. However, isn't it nice to receive a real postcard sent from holidays? Or come back from work and find a note "Stop by for a coffee, I got your email" left on our door from a neighbor? 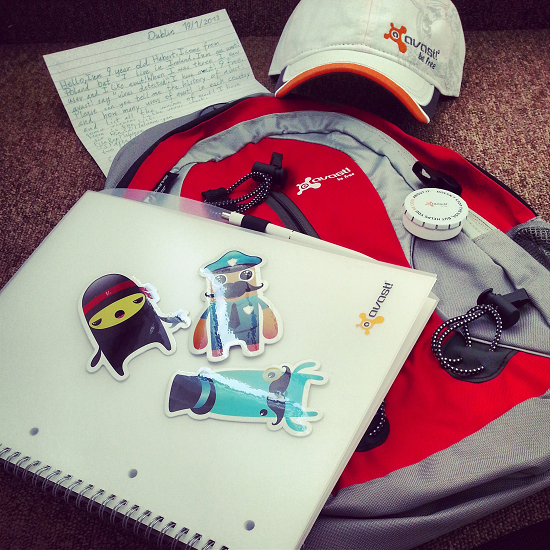 Last week, at AVAST Software we have received a letter. No, no, this is not what you are thinking of. A real LETTER delivered by the postal service! A handwritten letter from 9-year old Polish boy, living in Ireland. 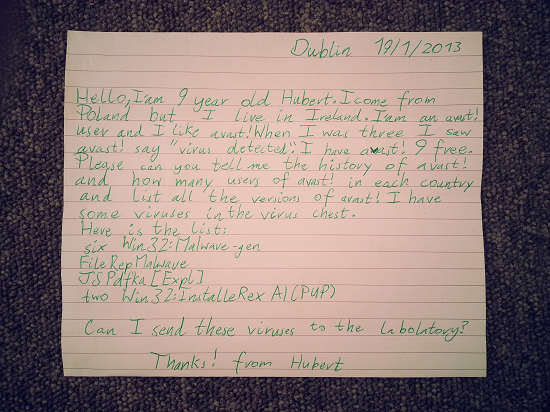 Hubert send us not only greetings, but also a request for Virus Lab analysis! He made our day and his letter has been circulating around the company for the last few days.